The Grammar School is the first school in the Nicosia district to become a Microsoft Office testing center under the Microsoft IT Academy Program e-Learning (training materials). 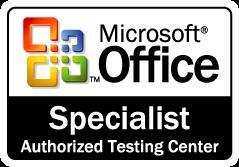 Students have the opportunity to take the Microsoft Office Specialist (MOS) examination. MOS is a globally recognized qualification and the leading IT certificate in the world. More than 1 million MOS exams are taken every year in over 140 countries. Students who take the MOS exams will gain the necessary expertise to competently use Microsoft applications, resulting in heightened levels of individual performance, confidence, and differentiation. It also builds individual distinction and prepares students for an increasingly competitive advantage in workforce. Furthermore serves to objectively validates their IT skills and assists in their advancement in their chosen career. Each certificate is a qualification in its own right, so students can take just one, or as many as they like.